From 1937 to 1940, Japan occupied Shanghai. In truth, the Dadao puppet government was short-lived, at least in nomenclature. The malodorous characteristics of its leading members, a potpourri of Venerable Mother religious cultists, smugglers, gamblers, narcotics dealers, panderers, and former rickshaw pullers, were liability enough. But just as damaging was the Japanese handlers' contempt for Su Xiwen, whose philosophizing was not taken very seriously after the Special Services brought in a tough north China hanjian (collaborationist) named Wang Zihui to run their Shanghai operations. [...] Consequently, after the puppet administration in north China was incorporated in January into a single provisional government, in South China a "Reform Government" was set up in March 1938 in Nanjing headed by Liang Hongzhi. [...] Within a month, on April 28, 1938, the Reform Government has commissioned a Supervisionary Yamen to take over the functions of municipal administration formerly wielded by the Dadao puppet regime. 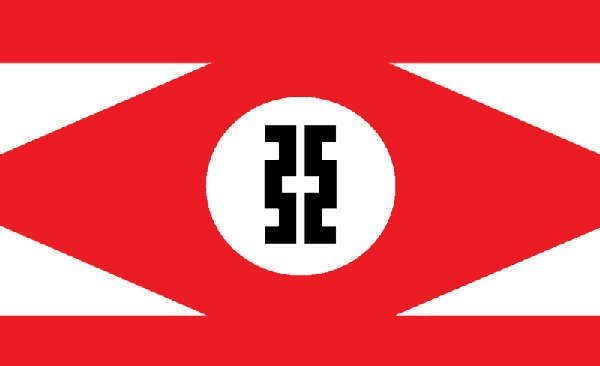 Su Xiwen formally recognized the superior legitimacy of the Reform Government by adopting its flag in May 3..."
5 May 1938- 29 March 1940: Reform Government, 1912 flag. 30 March 1940 onwards: Nanking Government, PoC-1927 flag with pennant. 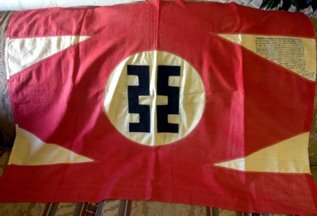 This is the flag of New Peoples Society in Beijing 北平新民会 in Dec 1937 which was yellow flag with green and red yin-yan design in the center which is very similar to the reported flag of Shanghai Great Way government supported by Japan. I have no idea of what is the background the flag used in Beijing became Shanghai government flag. Is there some proof that Shanghai government used the yin-yan flag ? Japanese old magazine Asahi Graph Dec 1937 at national Diet Library Tokyo. There is photo of a flag my father was awarded in China. It is a Japanese flag that flew above the city of Dong Ping, China when re-captured by the Chinese in 1945. I have been unable to locate the Japanese origin of this flag. Any information as to the source of this flag will be deeply appreciated. I am also enclosing the interpretations of the characters upon it in English to hopefully help you in identification. The Dong Ping Flag. "This is a flag used to be hung shamelessly over the city of Dong Ping by the Japanese bandits. They advocated that they are invincible and they are also going to build the so called commonwealth of Asia. They deployed around 15000 infantry, 800 cavalary, 1000 vihecles, 200 tanks and some aircrafts and also 20000 Collaborationist Chinese troops against us. They wanted to wipe us out by destorying our homes and killing our people. We are so determined to break their evil plan. We turned their dream into tear. One detachment of our troops had travelled two days and two nights. They came through great difficulties and got the city back from Japanese. We replaced this flag with our flag and we won the battle. To Mr. Albert. Your Dear Comrade Li Jue. 1945.1.23 "
Please answer if you can be of help, and your time is deeply appreciated. Mr. Albert was my father, Albert J. Fisher. An American pilot shot down, captured by the Japanese and rescued by the then Communist Chinese. He spent several months traveling with them, and was awarded many high honor gifts. Xinminhui (新民會, "New People's Association"), a collaborationist, quasi-political-party organization in northern China under Japanese occupation during the Sino-Japanese War (1937-45). Note its semblance to the flag of Nazi Germany. Also a note on the black emblem: this is the "Fu" (黻) badge, an ancient Chinese symbol consists of back-to-back ideograms for a bow (弓). Traditionally it symbolizes knowing right from wrong; however in the context of the Sino-Japanese War, the emblem resembles the ideogram for Asia (亞), a reference to the Imperial Japanese ambition for a "Greater East Asia Co-Prosperity Sphere". New flag of New Peoples Society since Mar 1st 1943 which was changed from yellow flag to red/white with kanji 亜 initial of Asia in black in the center.